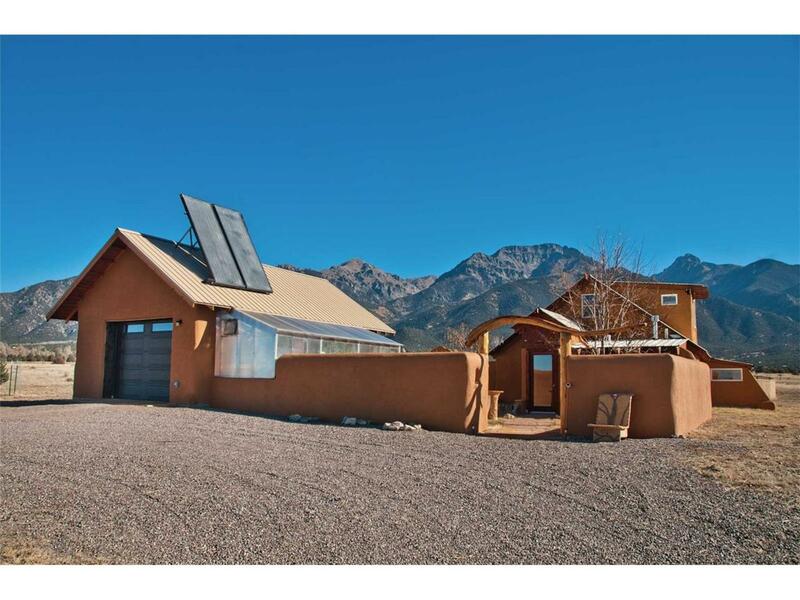 This light-filled 1902sf 2BR/1BA/Sunroom/Loft strawbale home has stunning 360 degree views of the valley & surrounding mountains. Remodeled in 2013&14 with new solar panels and batteries, a finished 536sf one car garage with 150sf greenhouse, new stucco, new fencing, new pressure tank for well, new stairs, magnificent garden and landscaped courtyard, east facing patio and more. The radiant in-floor heat is fueled by propane on-demand system with a hearthstone wood stove that only required one cord of wood last year for this highly energy efficient home. The open living space with high wood ceilings and bamboo floors has windows placed to catch the views and passive solar. Soak up the rays in the sunroom off the living rm. Bathroom w/ soak tub and views! Garage and greenhouse have solar radiant floor heating. wood ceilings and finished walls making it easy to convert to a studio or workshop. A 195sf shed provides plenty of storage. Sits on 8.98 acres including Lots 1381, 1444, 1445.